Just thought I'd add to my post from June on the Boys' Bedroom. This is a view of the upstairs landing from the boys' bedroom. People say the upstairs looks like the hull of a (small) ship. I have to agree that it's pretty tight quarters, but we've tried to make it feel as roomy as possible. •Interior Colors Reflect the Home's Brown and White Tudor Style— We painted the tongue-and-groove walls white with dark stained trim to family with the traditional brown and white tudor exterior. 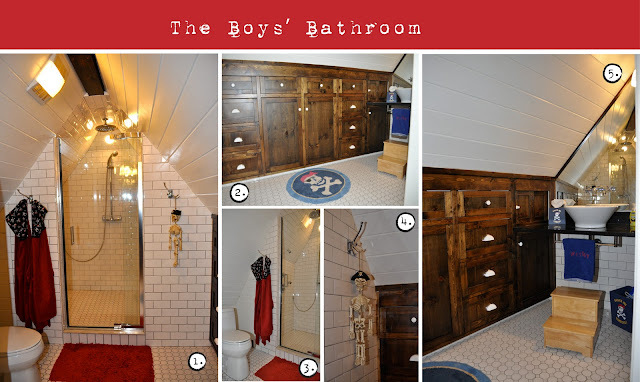 •The Other Rooms— The door to the left of the stairwell opens to the boys' bathroom. And behind the door on the right is my husband's office. 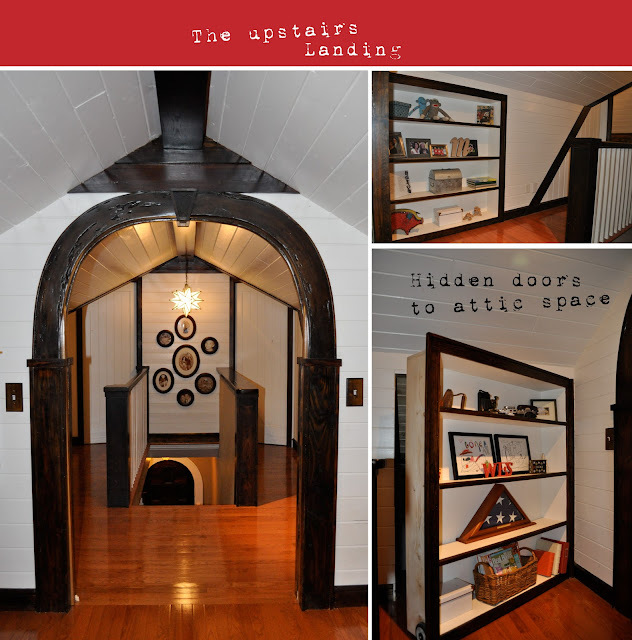 •Making Space for Storage— Wanting to make use of every available inch of space, we built shelves on either side of the upstairs landing that are actually "secret" doors to valuable attic space. 1. Shower—The bathroom turned out to be pretty big and with all the fantangled shower heads we put in, I kind of wish it was OUR master bathroom rather than the kids'! 3. Secret Opening— The slanted wall to the left of the hanging red pirate hoodie towels actually leads to more storage space behind the shower. That's where I keep my holiday decorations! 4. Pirate— That's a pirate skeleton hanging on that towel hook. See "Ship's Hull" reference. Hence, the pirate theme for the bathroom. That's about it! Thanks for taking a peek! Have a great week! Wow! What an amazing space. You've made the most of every inch of space and didn't sacrifice style to do it. So amazing. This is your attic???? We don't have too many of those where I live, so I think it is cool just that you have one, and what you've done to it is amazing!!!! I am such a big fan of those star lights, too. That would be my favorite part as well. OMG this is incredible. You thought of every detail...I love the hidden storage, the shower nook, the arched doorway. Wow, wow, wow! Absolutely amazing!! What a fantastic use of space! Fantastic Job! This is just beautiful....congrats on a job well done! Fabulous. Too bad they don't sleep in it ... maybe later. The Neighborhood Boo— think outside the pumpkin! Monday in my "ewe"niverse— My First GIVEAWAY!